Pioneers in the industry, we offer close coupled - mono-block watering vacuum pump, mono block water ring vacuum pump, close loop water re-circulation system and vacuum pump for packing industries from India. Our exported and supplied Close Coupled - Mono-Block Watering Vacuum Pump are widely accepted in the market fro their leakproof design and robustness. We procure these pumps from well-acclaimed vendors, who fabricate them by utilizing high-grade raw material and new-age technology. Available with us in wide specifications, these pumps have vital uses in power plants and industries. 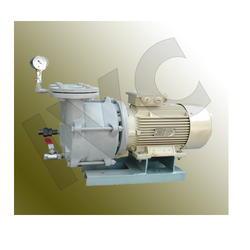 We are highly active in exporting and supplying superb quality Mono Block Water Ring Vacuum Pump. Our offered pumps are widely appreciated in the market for their robustness, high-speed functionality and low-maintenance aspects. Due to the procurement being done from trusted sources, we have wide specifications of these pumps. These pumps are supplied to customers at competitive market rates. IVC Close Loop Water Re-Circulation System offer total Re- circulation of the service liquid. Systems can be designed depending up on vacuum pumps’ capacities from 50-1200 M3/Hr. and can be offered in a wide variety of MOC (Materials of Construction) for tough applications. 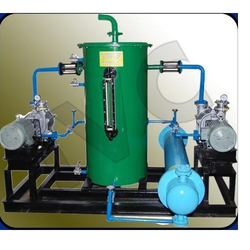 These system can be made available with either Single-stage or Two-stage liquid ring pumps having Shell & Tube Condenser and Plate type heat exchanger also. These are also available in Various MOC. Close coupled Mono-block Vacuum Pump for Packing Industries are simple, compact and mobile pumps which are also easy to assemble with Mechanical Seal to ensure Zero leakage. Looking for Close Coupled - Mono-Block Watering Vacuum Pump ?